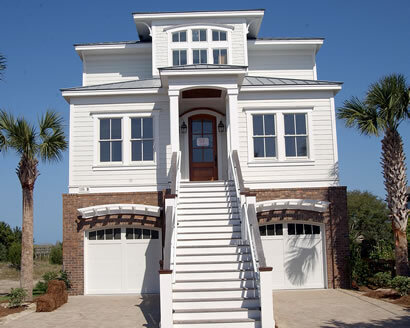 A beachfront Pawleys home with expansive views of dunes, beach, ocean and inlet, and its own distinctive boardwalk. Approximately 3,900 square feet HVAC space. More than 1,200 sq. ft. of decks and porches. 6 bedrooms, 5 1/2 baths. Master on second floor with vaulted ceilings, a sun deck overlooking the Atlantic, and heated floors in the bath. A shower on the second floor that&rsquo;s not to be missed. Combination HardiPlank shake and HardiLap siding. Matte silver standing seam metal roof. Barrel ceiling in entry hall. Lapboard walls, tongue & groove ceilings in interesting places...the kind of details that make a house fun to explore. Living room with exposed beams and mahogany trim accents. Heart pine floors throughout. Tile/stone in full baths. Tile in the laundries. Gourmet kitchen with all the top lines... Wolf duel-fuel gas range/electric oven, 48" Sub-Zero. Extra touches like double dishwashers. Microwave drawer and an ice machine. Stereo speakers throughout, along with Cat5 cable. Granite, marble & Corian countertops. Custom cabinetry by Signature of Charleston. Two garage bays, brickwork foundation lattice and ample parking space underneath house, along with beach shower and dressing area.